economic freedom, drought, "property rights"
Cape Town is not the first city to face a drought, but it is predicted to be the first major city to run out of water. Municipal water restrictions are in effect and “Zero Day” is expected to arrive in June 2018, at which point the municipality will be unable to supply any water to its residents. 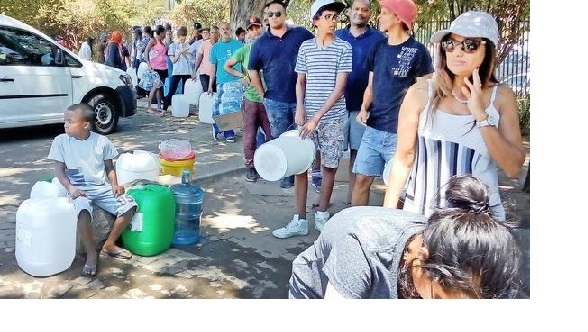 The short-term supply problem is serious and although the current drought might be the most severe in the lifetime of anyone currently living, it is not said to be the worst drought ever faced by the Cape Town region. In the past, Cape Town has prospered and always survived the vagaries of the weather. People choose to live in cities for the very reason that they flourish in the presence of other productive people with whom they exchange goods, knowledge, and companionship. In recent years, Cape Town’s population has grown by more than half a million people per decade. Yet in the city, no one remembers a “Zero Day”. What is different now? The natural water supply in South Africa is no different to what it has been over the last several hundred years. Water management systems and physical technology have made most of the water in the region potentially available for human use. But demand is clearly outstripping supply. Since the end of the 19th century, South Africa’s population growth rate increased as food supplies became more abundant and more reliable, and as access to good medical care improved. The cities grew as networks of enhanced productivity – and standards of living rose. Prosperous people can trade for what they need and can afford to maintain reserves in their households, in their businesses, and in their municipal works. Nevertheless, in the case of water, demand is overtaking supply. Why is food plentiful but water in short supply? We have no reason to believe that water is escaping from the earth at any significant level, just as we see no increase in all the other minerals. The amount of matter in the world hardly changes, yet in each decade we seem to have more of almost everything than in the decade before. It is the exceptions that are now remarkable. But in some societies, shortages are not only common, but general across most commodities and products. Witness Venezuela, where the rise of socialistic government has necessarily resulted in the loss of property rights and has divorced people from the relationships and materials that are essential to their sustenance. Similarly, we all remember that Zimbabwe began its post-transition life as a net food exporter but came to suffer the consequences of attenuated property rights as the government expropriated land and, by imposing heavy regulations and tax burdens, expropriated people’s wherewithal to prosper. In both societies, the loss of property rights and the loss of economic freedom resulted in economic stagnation, poverty, violence, and weakness in the face of natural disasters such as drought or storms. Even in more prosperous societies, where people have the right to control and to improve the value of their personal property, there are often examples of goods or services that are chronically in short supply. Sometimes this is deliberate, as in the case of professional licensing or agricultural “supply management,” where the real purpose is to restrict the supply to raise the price above where it would be in a free market. But in other cases, the cause of the shortages results from good intentions. In the case of water, the stated intention for the nationalisation of the water supply was to make water cheaply available to everyone. In real terms, a good is “free” only when it is sufficiently abundant and available that nothing needs be given up to acquire it. But when the government makes a commodity such as water available free of charge, people will use that commodity as if there is an unlimited supply. If the only cost to the user is turning on a tap or carrying a bottle to the community tap, then there is little concern for the quantity or wastage of the water remaining in the system after the user’s bottle is full. But the cost to society, which is the ostensible “owner” of the nationalised resource, is an outsized burden that increases as water users behave as if no one else is harmed, and as if there are no higher-valued uses for the water than their own. When the water supply is nationalised, then no one really owns it. No one user can benefit from conserving the water that they do not use. No one can sell, and thereby benefit from, their water rights to a buyer who values the water more highly. That buyer might have been an entrepreneur who would recognise a way, through better management and technology, of serving more people from a limited water source. Just as socialist countries discovered when they nationalised the food supply through collective farming, a nationalised water supply gives no one an incentive to manage that supply wisely. A price for water that is below the real supply cost gives no user an incentive to economise on water usage or to plan for future needs. The lack of private property rights, by reducing the need for thoughtfulness in the use of the resource, also prevents the generation of information that would help each of us move water, and water rights, to where they are most valued in the community. Well-defined property rights, that are tradable, would empower people to plan and to innovate to meet and to guide future water needs. Rather than wring our hands at the prospect of a “Zero Day”, we would build for the future with confidence. Author Richard J Grant is a financial and political economist based in Nashville, Tennessee. This article may be republished without prior consent but with acknowledgement to the author. The views expressed in the article are the author’s and are not necessarily shared by the members of the Free Market Foundation.